Talk about burning the candle at both ends…exciting times we live in, just don’t get burned…So many Fires…but the Inner Fire is the most important. Please see attached Press Release on 4 Directions Gathering. Chet is giving our friends a special discount of 15%. A time to return to ancient lands and remember the lost visions. 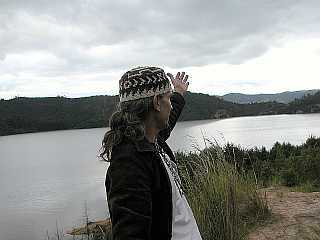 On May 18-20, 2007, considered the zenith of the 5th Galactic Day of the last period of the current Mayan Long Count calendar that ends in 2012, over 150 people from all corners of “Turtle Island” (North, South, Central America) will join respected Indigenous Elders and Wisdom Keepers from several native traditions in Sedona, Arizona, for the Four Directions Wisdom Gathering. These elders include: Grandmothers Flordemayo (Maya – Central America); Agnes Baker-Pilgrim (Northwest tribes: Oregon) of the Council of 13 Indigenous Grandmothers; Auntie Pua, Kupuna (respected one) and Kahuna (teacher of secrets) from Hawai’i; Willard Pine, elder and pipe-carrier of the traditional Ojibwa (Algonquin) nation of Ontario, Canada; Grandfather Martin Gashweseoma of the Hopi Nation, Arizona; Navajo story-teller, dancer and musician, Tony Redhouse, Inca Shaman, Wachan & Martika creating sacred music, and intuitive Sherry Merrell, with ancient crystal skull Synergy of Mayan legends. Leaders of the Agape International Spiritual Center, Reverends Michael Beckwith and Rickie Byars Beckwith, recently featured in the best-selling book, The Secret, will also participate. This unique Wisdom Gathering of Elders and Wisdom Keepers from many traditions in the sacred red-rock landscape of Sedona will not be another one-way “conference” where speakers talk to a passive audience but rather the opening of a “Heart Space” to share and dialog with our Elders. Imagine a form of “talk story” (as the Hawaiians say) about Present and Future prospects for Humanity as we enter the long-predicted Times of Change or Purification. The Hopi & Mamos of the Sierra have been warning us about these final years of the current Mayan Calendar Long Count. Is your heart open to receive new light? Conversation and Ceremony will explore ways we can create and sustain an Earth-friendly future for all of us in harmony with our planet. Why do we gather in Sedona? Quantum physics and traditional knowledge agree that the collective energy of a group of conscious people in sacred space like Sedona, especially with the aid of an ancient crystal skull, will be amplified and transmitted across Mother Earth much more powerfully and effectively than isolated, individual efforts, no matter how positively intended. May 18-20, 2007, the high-point of this final 5th Galactic Day before 2012 of the Western Calendar, is the most auspicious time for focused and positive pure intention to all our relations across Turtle Island. Some Elders call Turtle Island, Amerikua as North, Central & South America is the spinal column of the Earth and Sedona a vortex chakra of ancient time. If the predictions held by traditional Hopi, Kogi and Mayan Elders are accurate, this may be one of our last opportunities to collect and transmit these powerful sacred messages and frequencies across Mother Earth before the disruptive transition from the 4th to the 5th world begins. Even if Purification is postponed, many of these respected Elders know that the wisdom they hold may soon disappear with them or they will no longer be able to travel as freely. The Prophecy written in stone many years ago is being fulfilled as the Eagle and the Condor are coming together to bring the wisdom of ancient past. Between Friday evening’s opening ceremony featuring a traditional Hawaiian lei ceremony and Russell Means’ inspiring message to Sunday afternoon’s outdoor closing fire ceremony among Sedona’s Red Rocks, participants will share ideas with our Elders and learn practical tools to help us thrive as we pass through the predicted unsettled times of change and transition ahead. On Saturday evening we will join Navajo musician Tony Redhouse to energize our positive intentions with the uplifting vibration of music and song. Daytime sessions will include panel discussions with the elders and dialogue between all participants. call Karen: (928) 282-2450 or Chet: (928) 204-1962. Tony Redhouse, Musician, Artists & Incredible Navajo story-teller. This entry was posted on May 12, 2007 at 2:09 am and is filed under Uncategorized. You can subscribe via RSS 2.0 feed to this post's comments. You can comment below, or link to this permanent URL from your own site.